Alex & Kevin are engaged and getting married in August 2020! Woohoo!! These two are so adorable together and seriously were a dream couple! So willing to frolic through the deep snow and adventure to some awesome spots along the river. Alex and Kevin plan to have their wedding here in Washington, but then also have a reception in Romania, where Alex is from. Romania!!! This session was so much fun with having Alex rooting for the UW Huskies and Kevin for the WSU Cougars. They went to these separate colleges, but found some common ground with, you know, falling in love. 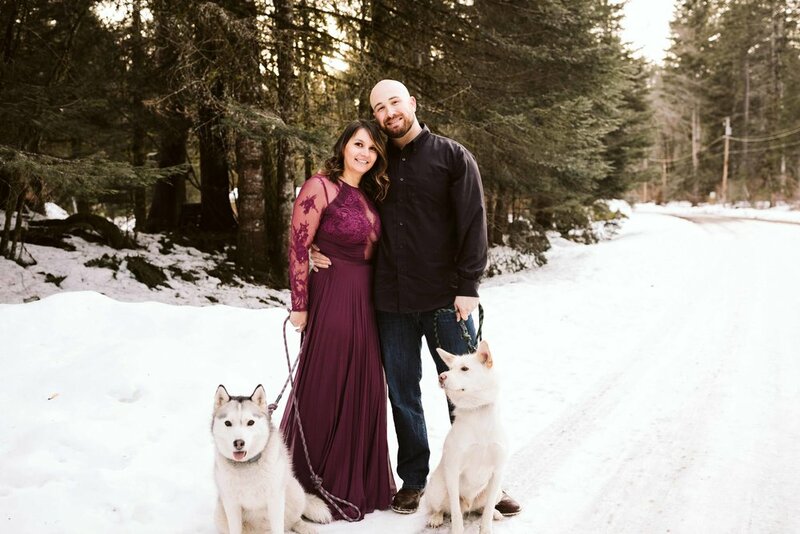 Alex also said that because they own a Husky puppy that she basically won lol So naturally, they both wore their rival jerseys and Apple Cup reversible scarf but were still totally adorable smooching in the snow covered forests around Skykomish. Kevin actually proposed to Alex right in this same private little picnic area, so this engagement session was extra special. Kevin and Alex met at a mutual friend's birthday party where Kevin asked her out on a date the next day. 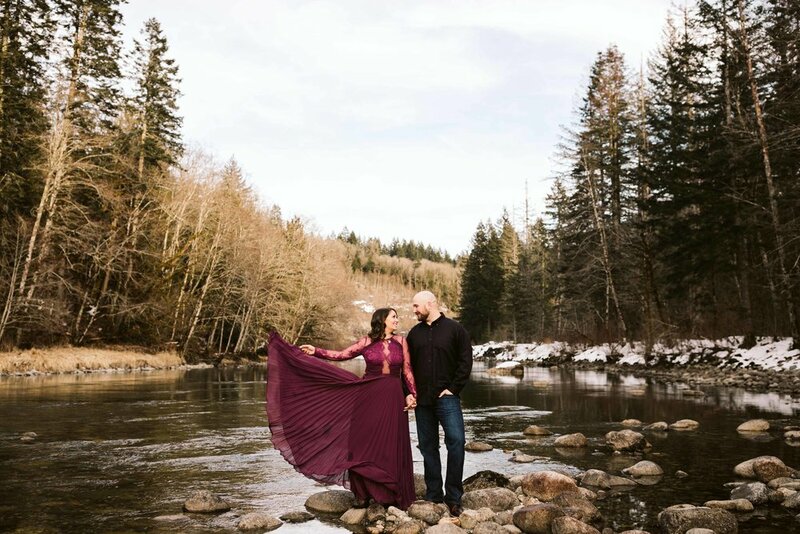 Many dates later Kevin proposed last June during a little mountain cabin getaway on the shores of the Skykomish river. With their two adorable puppies, we had such an awesome time wondering around Skykomish and capturing their love for each other. Seriously, every time I was adjusting settings or reviewing the last photo, Kevin would give Alex a little kiss on the forehead and then smile at her— SO CUTE! These two are so in love and I can’t wait for their wedding next year! PS: I also stopped by the Insta-famous A-Frame Tye-Haus Cabin on our way to the session. Wippee! Wondering what to wear for your engagement session? Check out this Bridal Banter Post!